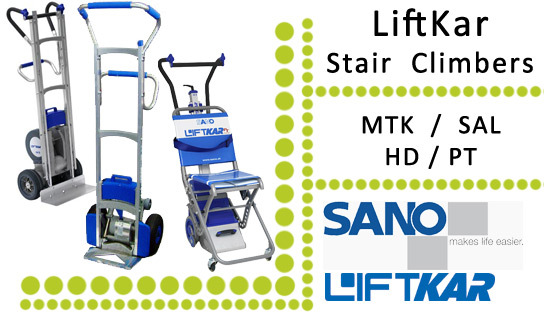 The Liftkar HD is the universal solution for transporting high and heavy loads over all types of stairs and steps. The folding dolly system attached to the base frame of the LIftkar HD Universal extends the function of this stairclimber. With the dolly system folded down, you can switch of the Liftkar HD and simply wheel it around on level ground. The load is completely supported by the wheels of the stairclimber. This function is greatly appreciated by the suppliers of electrical enclosures and drink dispensers because it enables you to transport heavy loads effortlessly through normal- sized doorways and down -stairs. The ergonomic design of this stair climber and optimum layout of its controls let you adopt an energy - saving and upright posture whilst travelling up and down stairs. If you require any additional information regarding machine hire from Specialist Lifting Solutions Ltd please feel free to contact us on the information below. We provide our Hire services in the following locations; Hire in Swindon, Hire in Cirencester, Hire in Stroud, Hire in Tetbury, Hire in Nailsworth, Hire in Malmesbury, Hire in Oxford, Hire in Cheltenham, Hire in Bristol, Hire in Chippenham, Hire in Hereford, Hire in Birmingham, Hire in London, Hire in Cardiff, Hire in Worcester, Hire in Newbury, Hire in Wiltshire, Hire in Somerset, Hire in Bath, Hire in Corsham, Hire in Trowbridge, Hire in Gloucester, Hire in Coventry, Hire in Surrey, Hire in Wokingham, Hire in Solihull, Hire in Reading, Hire in Guildford, Hire in Yate, Hire in Devises, Hire in Maidenhead, Hire in Uxbridge, Hire in Fichley, Hire in Croydon, Hire in Buckinghamshire.